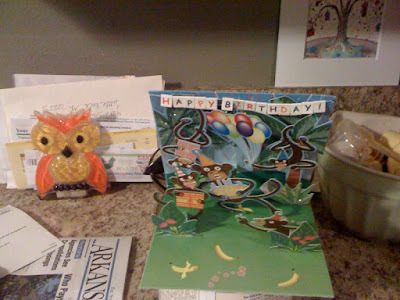 Nate's first bday card came early this week - all the way from Singapore! Tomorrow is his day of birth. and i remember vividly the first thought that popped into my head when he slid out - "he's HUGE!" (and something along the lines of "how was THAT inside of me?") i also vividly remember his arms and legs POPPING out from their little womb ball as karl caught him. BAM! tee hee. awesome. thanks for listening. i will post a couple pics tomorrow! if you are in LR and want to attend Nate's birthday party (and preferably i know you) please email me for details. Time flies Kat, I can't believe he is already one! Hope you guys have a great birthday party! happy birthday nate!!! omg, can't wait to see pictures from his party! YAY!! I cant believe it's been a year!! Happy Bday Nateriffic!! It is hard to believe that Nate has been around for an entire year. It is hard to believe he was tiny. Are you really holding Nate in that picture? Dude! It is hard to believe that this time last year I truly had no idea how you felt in that picture. Now I do and for that reason I say congrats all over again. AWESOME! We are so glad it arrived in time :) Hope Nate (and his Mom and Dad) has a wonderful 1st birthday! Yay Nate! Happy First Birthday. I love that picture of the three of you. Doesn't it make you miss him being so small! (even though you thought he was big) We are going to the lake in attempt to get some sun before our vaca. I'm sorry I am going to miss the party. I know it will be fun. Can't wait to see the pics. I still love hearing stories about that day. What an event! I will never forget the morning I read your story...wow! Happy Birthday little man. Can't wait to see you! !